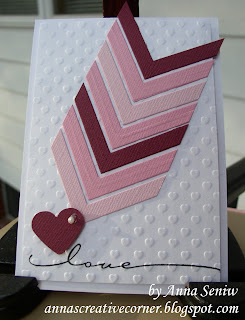 A Peek Inside The Creative Corner: Chevrons Made with Square Nesting Dies! As you know, I am taking the CAS card class. Saturday, JJ Bolton showed us how to make chevrons with square dies! 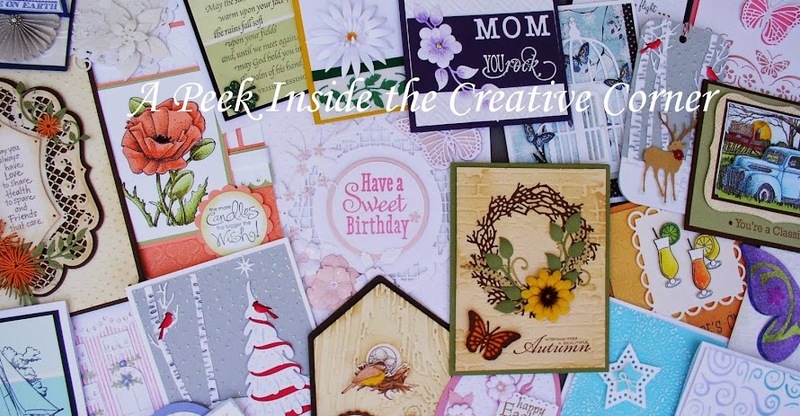 What a clever idea and a great way to "stretch" the use of your dies! I couldn't wait to go and try it out! Believe me, it was as simple as she had demonstrated! The hardest part was to evenly space the nesting square dies and tape them down. I used "Post-it" tape and it worked wonderfully. Another great tip was to use the same Post-it tape and lay the chevrons on it. This way you can space them out evenly and then adhere them to your card all in one step. When I passed the dies through my Big Shot, I ended up with 8 chevrons. Each time I used a different color card stock, I got 8 more chevrons. Once that was done, I only had to put the card together. I just love this bold and modern look. I then had to try another color combination and thought of a patriotic card for our soldiers. Stop by if you need some extra help or tips in getting your chevrons done. These are so addicting, you won't be able to stop making them!